With summer fruit season starting to wind down and the fall harvest looming in the horizon this is a great time of year to start thinking about preserving. We’ve rounded up our (current) favorite five Ontario blogs with a preservation focus. 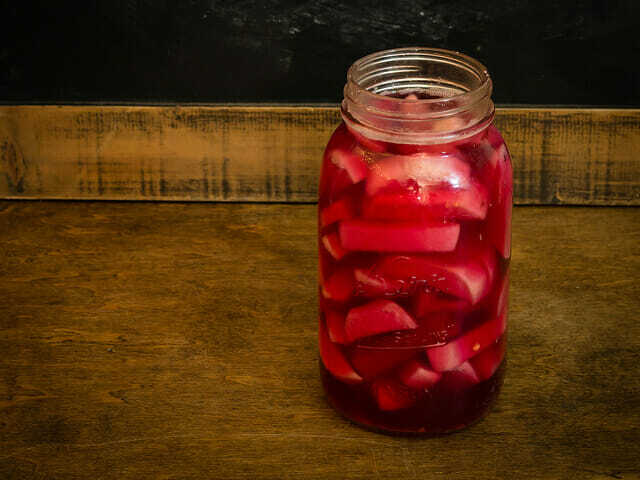 These writers show us how to cure, can, pickle and ferment so we can enjoy nature’s bounty all winter long! Run by Joel MacCharles and Dana Harrison since 2008, Well Preserved does it all. Their blog tackles everything from alcohol-based preserving to dehydrating and anything in between. Take a peek in to their awesome fermentation section. We’re especially excited to try out their fermented turnip pickles in preparation for our next shawarma craving. If some of this stuff feels a bit advanced, you can also check out the workshops that they run in toronto! Coming from Ottawa is Jane Craske’s blog, Jane’s Adventures in Dinner, which was started in 2010. Jane has a great canning section that covers the sweet, savoury and sour. There is a clear focus on seasonal and local produce here, which isn’t surprising given that Craske’s family has owned a farm in the Ottawa Valley since the 1800’s. The relationship her family had to the land led to canning and preservation being skills that were passed along through the generations. These mustard pickles really caught our eye! Meyer lemon marmalade from Toronto Tasting Notes. Sarah B. Hood has an illustrious career as a writer, which is probably what makes her blog such a pleasure to read. She is located in Toronto and often discusses festivals and farmers markets in southern Ontario. Sarah’s blog is great for those with a bit of a sweet tooth. We think her plum conserve is exactly what our morning toast needs. If you like what you see on her blog check out her latest book, We Sure Can!, for more preservation recipe ideas and collaborations from around the world. David Ort started his food blog in 2009. Ort presents a really well rounded blog with a serious local focus. He also touches on curing and preserving meat, which a very technical realm often left unexplored. We are working up the courage to try his duck breast prosciutto, a recipe that is sure to impress anyone! If you’re looking for something a bit more accessible though try out the small batch spicy sauerkraut and let us know how it goes! Last but not least we have the Local Kitchener run by Jon from Kitchener, ON. This blog features a slew of information including gardening tips, meal plans, recipes and brewing instructions but what made our mouths water was the peach salsa! Jon’s blog may not have the most preservation recipes but his commitment to staying as seasonal and as local as possible really inspired us. If you’re looking for something a bit more offbeat we think the fermented ketchup might be up your alley.